Details of new 8-core 16-thread Intel Coffee Lake CPUs have leaked online. The top-end Core i9-9900K can boost up to 5 GHz out of the box and has a TDP of 95W. The other SKUs in the lineup include the 8-core Core i7-9700K and the 6-core Core i5-9600K both without Hyperthreading. Intel's plans to introduce an 8-core 16-thread mainstream processor by Q3 2018 is not exactly a secret. There have been numerous sightings of 8-core Intel parts on various benchmarking sites but for the first time, we are getting to know some more details about the purported Intel 9000-series family. 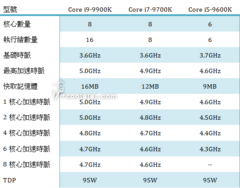 Chinese site Coolaler lists details of three CPUs — the Core i9-9900K, Core i7-9700K, and the Core i5-9600K — in the 9th generation family. These CPUs will be Intel's mainstream 8-core offerings to take on the 2nd generation Ryzens particularly, the AMD Ryzen 7 2700X. The Core i9-9900K is the flagship chip with 8 cores and 16 threads via Hyperthreading. The Core i9-9900K sports a 95W TDP with a base clock of 3.6 GHz, boost clock of 5 GHz out of the box, and a 16 MB L3 cache. The 8 core maximum boost can go up to 4.7 GHz. Next in line is the Core i7-9700K with 8 cores but no Hyperthreading support. The Core i7-9700K is also a 95W part that has a base clock of 3.6 GHz, turbo boost of 4.9 GHz, and a 12 MB L3 cache. 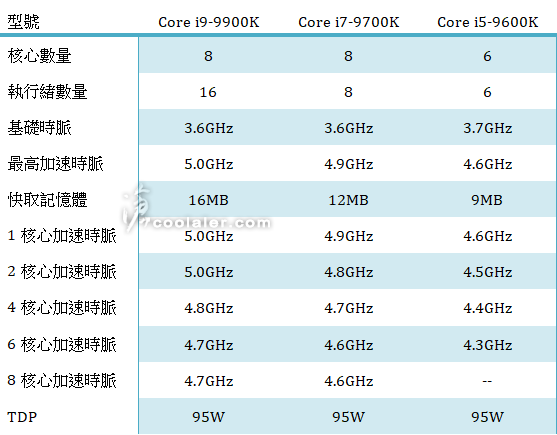 The 8 core maximum boost can go up to 4.6 GHz. Finally, we have the Core i5-9600K, which is a 6 core CPU without Hyperthreading. The 95W Core i5-9600K has a base clock of 3.7 GHz and can boost up to 4.6 GHz. It has 9 MB L3 cache and a 6 core maximum boost up to 4.3 GHz. This being a leak, the above details are to be a taken with a grain of salt. However, it does point out Intel's ambitions (or rather, desperation) to dethrone AMD Ryzen. The Core i9-9900K squarely aims at the AMD Ryzen 7 2700X and has the potential to become the fastest 8-core CPU in the market with good multi-core performance. There is every chance that AMD could very well release the Ryzen 7 2800X in response to the Core i9-9900K. Rumors point out the pricing of the Core i9-9900K to be around US$450 so the Ryzen 7 2700X definitely has a advantage in terms of value for money. What will be interesting to see is how the Core i7-9700K performs. It comes as a bit of a surprise that this CPU does not support Hyperthreading (assuming this information is true) but its expected retail price is around US$350, in line with the Ryzen 7 2700X. Intel generally has an advantage in single-threaded applications and gaming so whether the Core i7-9700K can manage to dent the Ryzen 7 2700X's sales in any manner is something to watch out for.